Hearth Cooking Saturday: What’s for breakfast? Visit the Prescott family in the Phoenix Mill House to experience breakfast 1830s style! The day’s menu includes sausage and potatoes, codfish cakes, hasty pudding, and waffles. Guests can sample these tasty dishes cooked over the open hearth and learn about home life at the beginning of the Industrial Revolution. 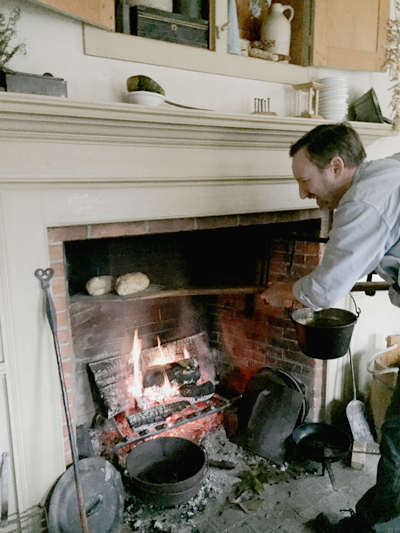 Hearth Cooking Saturday is an open house program- stop by for just a few minutes or stay longer enjoying samples and conversation by the fire with our costumed interpreters. Guests are invited to take home a copy of the day’s recipes to try on your hearth or in your modern kitchen. The Prescott family lived in the mill house in the 1830s when Samuel Prescott was an overseer at the Phoenix Mill, a large textile factory at the corner of Main and Grove Street in downtown Peterborough. Admission to Hearth Cooking Saturday is free. Donations are appreciated.